I'd just lost my two husky mix brothers a week before, but I couldn't bear not rescuing another dog in their place - my female Pit Bull, Sapphire, while she has other doggy friends here they're all guys and she needed a gal pal, according to my husband. We headed over the the Buchanan Animal Shelter in Grundy, VA, looking for a relatively young dog that could match Sapphire's high activity level and that's when we found the most beautiful, 1 year old German Shepherd female and we had to take her home. She and Sapphire became quick friends - but she's terrified of our cats! She is warming up to the calm ones now, but one of our tom cats is very touchy and wants to play so she's still a bit fearful of him. A few weeks later we ended up with three beautiful puppies - if unexpected! She was to be spayed and have her shots done on that Thurday (Sept. 24, 2009) but she had pups on Sunday (Sept. 19, 2009). They're all healthy, thankfully, and she's a wonderful mom - but I find myself very angry at the person who let her get pregnant in the first place and then dumping her off at the pound just weeks before she was due. I love her though, we all do, and she's a smart, lovable dog, as are her puppies - who are German Shepherd and possibly Boxer or Pit Bull mixes. Hey there, Hikari. It is good to hear from you. 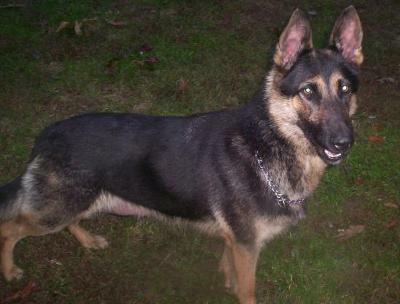 Thanks so much for taking the time to come here and sharing your German Shepherd Dog rescue stories with us all today. Love the picture - Saydi looks very happy just hanging out there!